How can I open an account with AxisDirect? You can click on the open an account button provided on our website www.axisdirect.in and leave us your contact details. Our representative will visit you to complete the account opening formalities. You have to pay a nominal fees of Rs. 999/- as one time account opening charges to open a 3-in-1 account with us. What are the different brokerage plans offered by AxisDirect? Please refer Charges and Subscription for further details. How can I create my User Id and Password to login to AxisDirect Portal? Step III - You will be shown email ID registered for your account. If it is correct you can cliick on Proceed to complete registration process. Now, the last thing you need to do is activation of your account by clicking on the verification link sent to your email ID. In case it is not correct, you can opt to modify the same and enter your correct email ID and click on Proceed. From Next trading day onward, you will start receiving all communication from AxisDirect on your new email ID. You will need to activate your account by clicking on the verification link sent to your email ID. In Step I, Instead of Debit Card, you can also use the OTP Option. (OTp wil be sent to registered email id for NRI Users). I have received my activation mail but when I click on the activation link I get a message that my activation link is expired. What should I do? How do I activate Trade on Phone service for my account? To activate the Trade on Phone services, please call us at our Customer care number 022-40508080 / 61480808 and select option 1 from the list of main menu options played on IVR System and follow the instructions thereafter. Why did I get this issue? Automatic processing of complex Corporate Actions are taken in to account in the new version of the Portfolio module. Any manual transactions added earlier by you to rectify your holdings, may now reflect as excess quantity. Step 3: On mouse hover of that particular manual transaction you would find ‘Edit/Delete’ icons on the right hand side. I have not received my activation mail. How do I get my activation mail? You can login to our website:www.axisdirect.in and then click on " Support > Login Support > Activate Your Account ". A request form will open wherein you are required to provide your basic details for verification. Once the details are verified you will receive the activation link on your registered email id. Corporate Actions like Merger, De-Merger result into addition of new stocks in your portfolio. Such stocks will be over and above your traded stocks. Step 1: On the Portfolio Summary page click on 'View Details' on the card of that particular stock. This happens when sell transaction qty through AxisDirect is higher than the buy transaction qty. This may be due to non-Axis Direct transactions / off-market transfers like ESOPs, DP transfer from another broker, IPO/s allotment made through physical application etc. Step 1: On Portfolio Summary page click on ‘Add Stock’. Step 2: Now add details of offline transaction like quantity, price, date, transaction cost etc. and submit the transaction. This could be due to some of your off-market transactions in Demat A/c like ESOPs, DP transfer from another broker, IPO/s allotment made through physical application etc. which do not reflect in your Portfolio. You can ‘Add’ the off-market transactions manually as follows:- Step 1: On Portfolio Summary page click on ‘Add Stock’. What is the price band range applicable in Pre open session? In Pre open session uniform price band of 20% is applicable. What type of orders can be placed in Pre Opening Session? In BSE, Only Limit orders can be placed in Pre Opening Session. Market Orders are not allowed. In NSE, Both Limit and Market orders can be placed in Pre Opening Session. At the time of execution of trades, Limit orders will get priority over market orders. Orders such as orders with Stoploss, Disclosed quantity and IOC Orders (Immediate or Cancel) cannot be placed in Pre Opening Session. What is Session timings in Pre Open Session? Session; Time; Action: Order Addition/Modification/Cancellation. Session: Order Entry Period, Time: 9:00am - 9:07/08am, Action: Dissemination of Indicative Price, Cumulative buy & sale Quantity & Indicative Index. Session: Order Matching & Confirmation Period, Time: 9:08am - 9.12am, Action: No Order Addition/Modification/Cancellation. Session: Opening price determination, order matching and trade confirmation & trade confirmation, Time: Buffer Period 9:12am - 9:15am, Action: Transition between pre open and continuous trading session. Session: Continuous Trading Session, Time: 9:15am – 3:30pm, Action: Trades occur continuously as orders match at time/price priority. Are there any charges if client related document are sent physically if not delivered in Email ? AxisDirect delivers important client related documents in an electronic form to the registered E mail Id provided by the client. In case of bounced mail, AxisDirect will send the physical documents to the client. The handling charges for physical documents will be Rs 10.00 per document. Are all the scrips eligible for trading in pre Opening Session? No, at present scrips forming part of BSE Sensex and NSE Nifty are allowed for trading in Pre Opening Session. Whether ASL will allow me to participate in Pre Opening Session? Yes, ASL allows you to participate in Pre open session. Trade-on-Phone service facilitates placing of Order through a dealer. Customer care number 022-40508080 / 61480808. How is Average Trade Price of Options Open Position is calculated under Open Positions page? The average trade price mentioned in the Open Position page is calculated by considering the day’s net trade value with total open position quantity. All carry forward Option contracts will be taken at Nil value for the purpose of calculation of current average trade price. What category of stocks are traded in Periodic Call Auction Session (PCAS)? Scrips which are categorized by the Exchange as 'illiquid securities' are traded in the Periodic Call Auction Session (PCAS). How does the trading process work during the Periodic Call Auction Session (PCAS)? The order entry period lasts only for 45 minutes, during which orders can be entered, modified and cancelled. This period ends randomly during the last one minute (between the 44th and 45th minute). The random stoppage is exchange driven. The next step is the order matching and confirmation period, which lasts for 15 minutes during which the opening price is determined and trades are executed. What order types are accepted under this segment? Only Limit Orders (including Limit IOC Orders) are accepted under this segment. Market Orders are not allowed. What are the different products offered by AxisDirect? 1.Cash - Transact for delivery: 'Cash' is a facility used for undertaking delivery based transactions. You have to pay the full order value while placing a buy order. You will get the shares in your demat account on the T+2 nd trading day. Similarly you need to have the full quantity of stocks in your demat account before selling in 'Cash' while placing a sell order. 2.Inter-Settlement (IS) - You place a buy order in Cash product, it takes T+2 days for the shares to get credited in your Demat account. IS a trading facility which can be used for selling the shares that have yet not been credited in your Demat account. Eg. You have placed buy order for 100 shares of Axis bank on Monday. You allocated Rs.1,50,000 in Cash limits to place this order. 100 shares of Axis Bank are to be credited to your demat account on T+2 days i.e. Wednesday. IS product from AxisDirect allows you to sell the shares on T+1 and T+2 days even before the shares have been credited in your Demat account. 3.Encash - Get immediate/emergency cash by selling stocks on Encash is a facility that helps you to receive the funds on your sale transaction on the transaction day itself. In case it is a Bank holiday on the transaction day, the funds will be credited on the next Bank business day. So, whenever you require funds in an emergency, just sell the shares available in your demat account and get the credit in your linked bank account on the same day. 4.Intraday - Buy and Sell on same day with low margin. Intraday is a facility which lets you to take positions in shares without taking delivery. You square off the positions on the same day before a pre-defined time with the intention to book profits. Such profits will be credited on T+2 working days in your linked Savings bank account. a) If you do not have funds equal to the transaction value, AxisDirect allows you to trade by blocking a small margin amount (20%-50% of the total order value depending on the scrip). b) The transactions occur on the same day so funds for the transactions are not debited and transferred from your linked Savings account. Funds will be debited only in case of a loss or if you decide to convert the position into delivery. c) You can Short Sell that is sell shares even if the scrip is not available in your demat account and then buy to cover (second leg of the transaction). d) If you do not square off the position by 2:45 p.m for any reason, it will be squared off by AxisDirect. Example: You buy 100 shares of Axis Bank @ Rs.1500 in intraday. The funds required to be hold marked will be approx. 20% of the total order value. So, you should have at least Rs. 30,000 (Rs. 1,500*20%*100) in your linked savings bank account. You are able to order 100 shares of Axis Bank at Rs. 30,000 against the actual order value of Rs. 1,50,000 (Rs.1,500*100). 5.Cover - Place Buy and Sell orders simultaneously and get better leverage based on your choice. Cover is a facility which helps to limit the losses (if any) on intraday trades. It helps in transacting at a lesser margins. Cover can be placed by creating two opposite orders on the same scrip. The first order has to be a market order and the second order is a stop loss order at limit price. The stop loss order (second leg) minimizes the risk of losses. In fact, such orders help you know the maximum loss in a position in advance. Such orders also require lesser margins as compared to 'Cash' and Intraday transaction as the order value range for the second order is fixed. Example, if you wish to place a Cover for 50 shares of Axis Bank, the order screen will ask you to place two orders. The first order is a market order at say Rs. 1500 and the second order will be a stop loss order where you will have to define the limit price and the trigger price. 6.E-margin - Buy on margin and square off today, tomorrow or day after. E-margin is a leveraged trading facility. Positions created under this facility can be squared off or converted to delivery till the T+30 day on or before a specified time set by AxisDirect. Unlike 'Cash', you do not have to pay the full order value for Emargin orders. So, you can take positions with lesser margin amounts with an option to keep the position open till a maximum of T+30 days. 7.Futures - Derivatives contract where buyer and seller both have rights and obligations to honor the contract. It is a contract to buy or sell an underlying asset at a specified future date. These contracts are traded and settled on exchanges. The quantity (Lot size) and the Settlement date (Expiry date) is fixed in advance. In India, futures are cash settled. It is a high leverage product as compare to cash market. (High Risk, High Return). E.g., margin required for taking position of 250 shares of Axis Bank @ Rs. 1,500 is Rs. 3,75,000 in Cash segment. If the price increase to Rs. 1,600 you make a profit of Rs. 25,000 (250*100) in Cash market. In Futures market, you pay a small margin to take a futures position. say, you pay say only Rs. 75,000 for 250 shares of Axis Bank. If the price of Axis Bank increase to Rs. 1,600, you still make a profit of Rs.25,000 with a margin of just Rs.75000. 8.Intraday Futures - Same day square off of Futures Derivatives contract.Intraday Futures is a facility which allows you to take futures position with the intension of squaring off the position on the same day before the market closes . Such profits will be credited on T+1 working days in your linked Savings account. The benefits of Intraday Futures is that the margin requirement is lesser than the regular Futures trading allowing you to trade in higher volumes. You can Short Sell Futures, that is sell first and then buy to cover (second leg of the transaction). If you do not square off the position by 3:00 p.m for any reason, it will be squared off by AxisDirect. Example: You buy 250 shares of Axis Bank Futures @ Rs.1,500 in intraday. The funds required to be hold marked will be approx. 15% of the total order value. So, you should have at least Rs. 56,250 8(Rs. 1,500*15%*250) in your linked savings bank account. You are able to order 250 shares of Axis Bank at Rs. 56,250 against the actual order value of Rs. 3,75,000 (Rs.1,500*250). 9.Options - Derivatives contract where one party has a right to buy/sell the underlying, while the other party has an obligation to buy/sell. The person with the right is called the holder/buyer of the option. The person with the obligation is called the writer/seller of the option. Options contracts can be classified under two categories based on "rights" and " exercise". There are 2 types of Options contract based on right– Call Option & Put Option. Buyer of the option needs to pay only the premium and his risk is limited. Seller of the option needs to pay the margin and his risk is unlimited. Exercise based options are- American Options & European Options. 10.Collateral management - Hold shares for additional margin limits.Collateral management is a facility through which you can utilize your idle shares to get trading limits for margin products like intraday, futures etc. 11.Subscribe for IPOs/FPOs – Easier way to participate in the primary market issues. IPO is initial public offering. When a company raises funds by floating its shares to the public for the first time, it is known as IPO. IPO is floated in the Primary market. Make online applications to IPOs/FPOs through AxisDirect without having the hassle of paperwork. What are the value added services offered by AxisDirect? All resident Indians above the age of 18 years are eligible to open an AxisDirect Online Trading account. Trading account can be opened for Individuals, Sole Proprietor, HUF, Trust, Company and Partnership Firm. Why should I open an account with AxisDirect? Axis Securities Ltd. is a 100% subsidiary of Axis Bank. It is a Trading member of National Stock Exchange & Bombay Stock Exchange in the Equity and Derivatives segments. It offers a seamless online trading experience due to electronic linking of Trading, Savings Bank and Demat accounts. To know more about why should you choose AxisDirect please visit the "Why AxisDirect" page on the website. What is AxisDirect Mobile App? AxisDirect Mobile App is a mobile-based application which allows you to trade in Equity and Derivative segments through your mobile phone. Is SIP allowed in exchange mode and how it works? Yes, in exchange BSE, Mutual Funds - SIP can be placed. Please note that, on placing a SIP order through Mutual Fund Exchange mode for a future date, the exchange will trigger the first order on the request date and pull funds from client`s account. Moreover, MF-SIP order can’t be modified . In the exchange mode, the SIP order must be placed 30 days before the SIP start date (date on which amount is debited from customers' bank account) Example: If order is placed on 10th Jan then start date should be 10th Feb or onwards. (The gap between the start date 10th Jan and SIP start date should be equal to or greater than 30 days). d) If you do not square off the position by 3:00 p.m for any reason, it will be squared off by AxisDirect. Example: You buy 100 shares of Axis Bank @ Rs.1500 in intraday. The funds required to be hold marked will be approx. 20% of the total order value. So, you should have at least Rs. 30,000 (Rs. 1,500*20%*100) in your linked savings bank account. You are able to order 100 shares of Axis Bank at Rs. 30,000 against the actual order value of Rs. 1,50,000 (Rs.1,500*100). 6.E-margin - Buy on margin and square off till T+90 in both the exchange. E-margin is a leveraged trading facility. Positions created under this facility can be squared off or converted to delivery till the T+90 or before a specified time set by AxisDirect. Unlike 'Cash', you do not have to pay the full order value for E-Margin orders. So, you can take positions with lesser margin amounts with an option to keep the position open till a maximum of T+90 days. Why invest through Wise Advisor? •You don’t have to place individual orders; whole basket of schemes or stocks (smallcase) gets purchased in 2 clicks. smallcases are a new way to invest in stocks. A smallcase is an intelligently weighted basket of upto 20 stocks that reflects a theme, idea or strategy. You can choose a smallcase based on a theme that you are positive on, invest in it in 3 clicks and track & manage multiple portfolios seamlessly. smallcases aren't a means of recommending or advising investors. Choosing a smallcase is up to each individual. MF Advisor is a robust & friendly advisor which will assist you in building your MF investment portfolio as per your financial goals, risk appetite and time horizon - instantly, anytime, and anywhere. I can see stocks in my holdings that I have already sold. The new version of the Portfolio Module takes into account complex Corporate Actions like Merger and De-Merger. Any manual transaction added earlier to rectify your holdings, may now reflect as duplicate transactions. Step 1: On your Portfolio summary page click on ‘View Details’ of the stock that you want to delete. Step 2: Click on ‘All Transaction’ tab & find your manually entered transactions. I see stocks in my holdings that I have not traded. Is the current value of my Portfolio that I see exact value as per the market rates of the stocks? No, the market rates based on which your Portfolio value is computed are delayed market rates with minimum 5 to maximum 15 or sometimes even more time. Please do not sell you stocks from your Portfolio assuming that the sale proceeds will be equal to the value shown. Where I can view transaction of Dividend received in stock / mutual funds in my portfolio? On this page, you can view all Dividend transactions in the current financial year in stocks held by you. The dividend transactions are sorted stock wise and within stock, by default they are sorted by latest on top. You can change Financial year or use date filter to view dividend transactions in a particular duration. You can also change the sorting order to sort by Date and choose between ascending/descending by date. can see Dividend details of current Financial year in stock name ascending order. You can also change financial year on clicking date drop down. Can I manually add some transactions in my portfolio and can I later delete or edit them ? Yes these feature are very much available; however, please note any change in any transaction like new addition/ modification and deletion would take effect in your holdings only on the next day. As and when I get trade confirmations when my orders are executed, do these trades immediately reflect in My Portfolio ? What is the difference between Short term capital gain, long term capital gain and speculative income? If stocks are sold within a period of 1 year from the date of Purchase, Gain/Loss is classified as Short Term Capital Gain / Loss. If stocks are sold after 1 year from the date of Purchase, Gain / Loss is classified as Long term Capital Gain/Loss. As per Income Tax Act, we are following FIFO methodology for computation of capital gain tax in Portfolio. The computation of Capital Gains/Losses Tax should not be used as a substitute for competent tax advice. It is meant to provide you with a reference point of your Capital Gain Tax liability. We request you to further take opinion of your tax consultants, professional advisor before arriving at any decision on the basis of the computation of the Capital Gain Tax liability. What are the brokerage charges for Equity Options traded. What is the charges for multi tier-variable plan? What are the Charges and terms and conditions of brokerage subscription Plan? Is there any Delayed payment charge on Derivative position where mark to market (MTM) loss is not recovered from you after exchange pay-in date? What are Transaction Charges levied by the BSE? Is there any Delayed payment charge on positions which are marked for E Margin(T+30)? Where can I see the delayed payment charge on late payment ? Yes, delayed payment charges at the rate of 18% p.a will be charged on outstanding debit balance on all E-Margin positions. The number of days delay would start from the exchange pay-in date for the settlement of the respective transaction and charged till the date the funds are actually received (eg. till the date of CTD or till the date of funds received/pay-out date after squaring off of positions). History -> Funds Settlement -> Delayed Payment Charges link under your Trading section. i. E Margin position from Funds only. Delayed payment charge on outstanding debit balance per day = outstanding debit balance * Delayed payment % per annum * 1/ 365 =80000* 18%*1/365 = Rs. 39.45/- per day or Rs.78.9 for 2 days . Delayed payment charge on outstanding debit balance per day = outstanding debit balance * Delayed payment % per annum*1/ 365=80000* 18%*1/365= Rs. 39.45/- per day or Rs.276.16 for 7 days . ii. E Margin position Convert to Delivery (CTD). Thereby, no delayed payment charge will be levied for the aforementioned transaction. Delayed payment charge on outstanding debit balance per day = outstanding debit balance * Delayed payment % per annum * 1/ 365=80000*18%*1/365 = Rs. 39.45 /- per day or Rs.197.26 for 5 days. Margin amount = (100*1000)*20% = Rs 20000 , this margin is adjusted against existing collateral limits only , no bank pay-in for margin amount. Delayed payment charge on outstanding debit balance per day = outstanding debit balance * Delayed payment % per annum * 1/ 365 =100000*18%*1/365 = Rs. 49.32 - per day or Rs.345.24 for 7 days. What are Transaction Charges levied by NSE? Transaction Charges will be charged @ 0.00325 for NSE Equity Segment and @ 0.00190 for Equity Derivative Segment. How can I view the turnover utilization of my existing brokerage plan ? How can I view to various brokerage plans offered by Axis Direct? How can I view my current brokerage plan ? Popular packages provides you the facility to view, renew and switch your existing brokerage plan along with other added benefits. What will be the brokerage charged for E-Margin carry forward open positions? E-Margin transactions will be charged delivery brokerage, if the position is not squared off on 'T' day. What is the minimum brokerage charged by AxisDirect? The minimum brokerage charged for all orders in Equity Segment except Equity SIP orders will be Rs 25/- per order for Resident Indian clients, HUFs, Corporates etc. 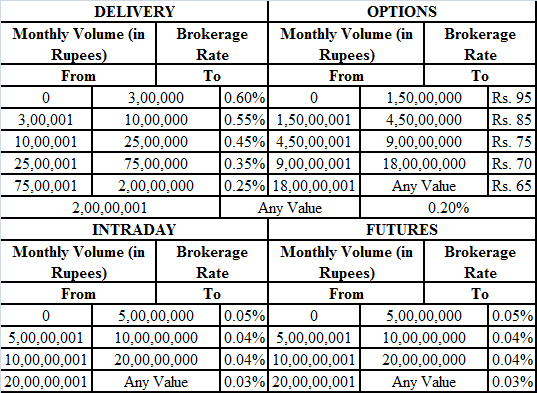 In Equity SIP the minimum brokerage charges will be Rs 20 per order. However the brokerage charged will not exceed 2.5% of the transaction value and Rs 0.25 per share in case of securities quoting below Rs 10. What is the account opening charge for an Online Trading account? By when will my eDGE Reward Points for AxisDirect investment get credited to my account? Points earned through eligible earn transactions will be credited to your eDGE Loyalty Rewards account by the 20th of the next month. Yes. Points earned on a particular day will expire after three years. E.g: Points earned on 10th January 2013 will expire on 10th January 2016.Alternatively points will also expire in case of no transaction on the eDGE Loyalty Rewards Account in a period of 365 days. For more details you can login to your eDGE Loyalty Rewards account or call the Axis Bank call center. Are all AxisDirect transactions eligible for earning eDGE Loyalty Reward Points? What is the maximum no of points that I can earn on my investment with AxisDirect? You can earn a maximum of 500 points through your AxisDirect account. How can I Earn eDGE Reward Points? You can start earning eDGE Loyalty Rewards points by investing in equity SIP and First trade in Mobile through AxisDirect account.